Update May 18, 2011: Antonea Nabors from VelvetAnt recently posted on her blog about what you need to do (link no longer available) if “you deleted your Google account and lost access to FeedBurner”. 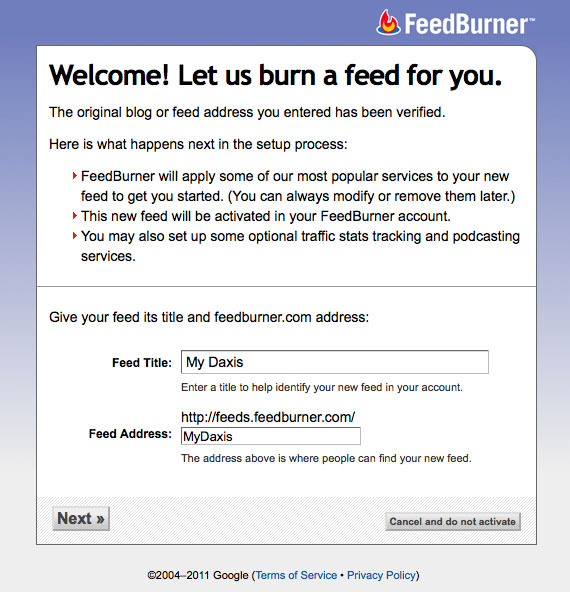 Soon after I created my very first self-hosted blog, I was playing with Google FeedBurner feed setting and accidentally deleted my feed URL. Luckily, I found a way to restore it after hours of trial and error. It’s actually very simple and easy to restore a deleted feed URL. Here’s what you need to do…. Note: This method works if you deleted your feed only. If you deleted your Google account along with your feed, then this method wouldn’t work for you. 1. Go to FeedBurner and log in. Once you log in and see the main page like shown in the screenshot above, type your website/blog address. I typed my old blog address—mydaxis.com—as an example. Click “Next”. 2. You will probably get an error message like this. Delete the “Feed URL” that’s shown in the error message. 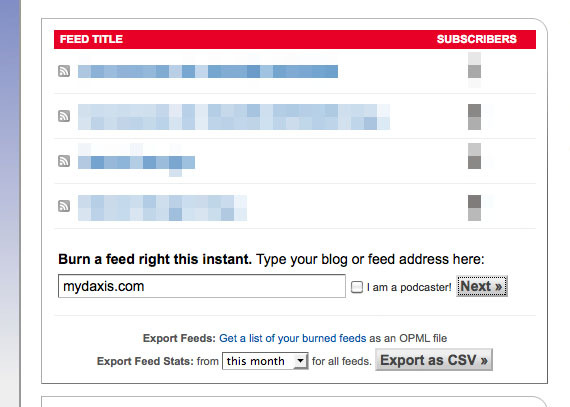 In the Feed URL box, type your website address and add /?feed=rss2 at the end of your website address. 3. Since I’m using mydaxis.com as an example, I would type mydaxis.com/?feed=rss2. Then click “Next”. 4. Now you should see a “welcome” message like this and your feed URL should be all restored! If typing /?feed=rss2 after your website address didn’t work, try typing /?feed=rss instead. Unfortunately, if you had subscribers, I’m not sure if your subscribers would be restored as well. When I accidentally deleted mine, I had just created my blog and didn’t have subscribers. If you were able to get your subscribers back when you restored your feed URL, please let me know by leaving a comment here. I would love to know how this method works for blogs with subscribers! Thank you so much for posting this, it’s a Godsend.. you are a hero!! Hi, Janice. Thank you for the nice comment. Oh, by the way, I started this blog a couple of months ago and you are the very first person to comment on my blog! Thanks again. It didn’t work for me.my blog is http://www.myjobnigeria.com.What do I do? Hi Omoniyi, I visited your website but it’s hard to tell what’s going on by looking at your website. Can you please give me more details? 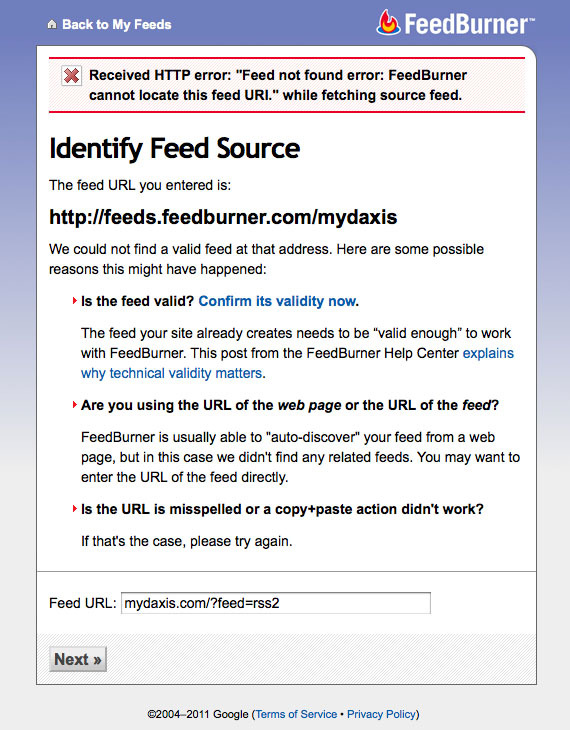 Was your FeedBurner Feed URL working fine in the past? Did you accidentally delete the URL just like I did? Or did you delete your entire Google account? Is there anything else I should know so that I can help you with this? Thanks for the details. I clicked on your Feedburner URL and did notice the error message. Hmmmm…I’m not sure why you get an error message saying “file size was over 512kb” when you tried fixing it. You shouldn’t have to upload, save, or transfer files when fixing this problem the way I did…so I don’t know what it means by “file size was over 512kb”. If you want my further assistance, can you please go to my “contact” page and send me a message with your Feedburner login information (your e-mail address and password). I’m not 100% sure if I will be able to figure this out even if I login but I will at least try fixing it for you if you can provide me with your login info. You will have to trust me, though. I promise you that I won’t share your login info with anyone. I just fixed your feed. I sent you an e-mail about it. I’m glad I was able to help you with this! So thankful I found this!!! I understand about “hours of painstaking trial and error”, been there far too many times. So appreciate you sharing. I will be sure to share this blog link on my site as well as where I see others having the same problem. Nice work Jessica. Hi, Tara! I’m so glad you found this post helpful. Thank you so much for leaving such a sweet comment. It took me a while to figure out how to solve the issue and to write this how-to post…but comments such as yours make it worth it! Hi I tried the steps you suggested and was still unable to get my feed back, any other suggestions?? Have you also tried Antonea’s method? If you give me more details about what happened to your feed, I may be able to help. Did you delete the actual account or just the feed URL? Just wanted to post that Feedburner no longer takes the ?feed=rss2 (or rss). Both the question mark and = sign are invalid characters. It will only take alphanumerics. Wonderful items from you, man. I’ve be mindful your stuff previous to and you are just extremely wonderful. I really like what you’ve bought right here, certainly like what you’re stating and the best way in which you are saying it. You make it enjoyable and you still care for to keep it smart. I can’t wait to learn much more from you. This is actually a great web site. Hey there, thank you for the kind words. 🙂 I’m happy to hear that you like my website. what if you forgot your user name and password! In that case, you can click on “Can’t access your account?” (which is at the bottom of “Sign in” box) and should be able to retrieve your user name and/or password. If that doesn’t work for you, I’m not sure what else you can do to retrieve your user name and password. I’m sure there’s another way but I just don’t know…. Sorry. Thanks a ton Jessica. I was searching for the solution to restore my deleted feed since last few days. finally i stumbled to your post on wordress forum and came here. You really did a brilliant job i successfully restored my feedburner feed url. Hi Rishabh, thanks for letting me know about the subscribers. I’ve been wondering what happens to the subscribers once the feed is restored. Now I know. Thanks again! it still didnt work for me ive tried everything out. Unfortunately, I’m not sure what can be done here to fix your feed problem as I’ve never encountered “feed filesize” error message before. I’m sorry I couldn’t help you. Hope you’ll have a nice weekend, though! Four years later this is still working. Thank you. Awesome tip here.